Steak is one of the most popular foods for first-time sous vide enthusiasts to cook, and with good reason. Cooking steak the traditional way, in a cast iron skillet or on the grill, leaves lots of room for error, and an over- or undercooked steak is a big mistake to make when there's a prime-grade dry-aged ribeye on the line. Sous vide cooking takes all of the guesswork out of the process, delivering steaks that are cooked to precisely the temperature you like each and every time. Not only that, because sous vide is such a gentle cooking process, you'll be able to achieve steaks that are more evenly cooked from edge to edge than what you'll find in even the best steakhouses in the world. That's right: Sous vide cooking allows you to cook better than the best steakhouse. We recently reviewed the best immersion circulators on the market, so you can pick one up to use at home right now. The timing and temperature charts in this guide, as well as all the FAQs and basic instructions, are part of our brand-new partnership with Anova, the makers of our favorite sous vide circulator, the Anova Precision Cooker. You can download the Anova Precision Cooker App (it's free) to grab all this information right off your phone or tablet for while you're cooking. And if you've got an Anova Precision Cooker, you can even control it directly from the app via Bluetooth. Of course, this information should prove useful to anyone who owns a functional sous vide device, or even someone hacking it with a home rig or a plain old beer cooler. Why Sous Vide Your Steak? What are the downsides to cooking steak sous vide versus using a more traditional method? Can a sous vide steak get a good crust? When should I season my steak? What happens if I leave a steak cooking sous vide for longer than the maximum time recommendations? Is it dangerous? Can I add a spice rub to my steak? Should I pre-sear my steak? What about deep-frying the steak instead of searing after cooking sous vide? Can I use a torch alone to finish a steak? What's the best torch for searing steak? Does steak finished with a torch acquire any off aromas? Can I chill and reheat my steak after cooking it sous vide if I haven't opened the bag? Can I cook a steak straight from the freezer? Does sous vide steak need to rest? With traditional high-heat cooking methods, hitting that perfect medium-rare sweet spot is about as tough as bull's-eye-ing a womp rat in a T-16. A moment too short or too long on the fire, and your steak will come out under- or overcooked. Sous vide precision cooking methods solve that issue completely. Sous vide precision cooking offers unparalleled control over your steak, letting you very precisely cook the steak to the level of doneness that you prefer. No more guesswork to guarantee a medium-rare temperature. No poking with a thermometer, no cutting and peeking, no jabbing with your finger—just perfect results every single time. It also increases the flexibility of your schedule. With traditional methods, your schedule is at the mercy of the steak. Once you start cooking it, it's a straight, nonstop shot until the finish line. Sous vide steaks, on the other hand, can be held for several hours before you finish them by searing and serving, which means that your steaks are ready when you and your guests are. Finally, sous vide offers results that are not attainable by traditional methods. With standard high-heat cooking, you develop a temperature gradient within the meat. The very center may be perfectly medium-rare, but the steak will be increasingly more well-done as you approach the exterior. With a sous vide steak, your meat is evenly cooked from edge to edge. Cooking steak sous vide is a two-phase process. The first phase involves sealing the steak in a plastic bag and cooking it to the desired final temperature using your sous vide device. The second phase is searing the meat to develop color, flavor, and textural contrast on its surface, and to help render and soften its fat. The temperature of the sous vide bath during the initial cooking phase is what determines the final doneness of your steak. Sous vide precision cooking is a great method for cooking any type of steak, whether it's a tender cut, like the tenderloin, strip, ribeye, or porterhouse, or a butcher's cut, like the hanger, flap, or skirt. For more info on selecting a good steak, check out my guide here. The thickness of a steak is not just about portion control. Without an adequately thick steak, it's very difficult to get that perfect contrast between exterior and interior. Very thin steaks will tend to overcook before they can finish developing a nice crust, even over the hottest fire you can build. With sous vide in particular, using a thicker steak will help you maintain more of that perfectly cooked interior during the searing process. I try to get steaks that are at least an inch and a half thick, if not a full two inches. This does mean that each steak ends up weighing between 12 ounces and a pound—that's big, even for someone with a healthy appetite for red meat. But remember this: It's better to cook one large steak for every two people than to cook two smaller steaks. Learn how to share. The doneness of a steak is by and large determined by the maximum internal temperature it reaches during cooking. For instance, so long as a strip steak does not rise above 130°F (54°C), it will never cook beyond medium-rare. With traditional cooking methods, there is a very short window of time during which your meat is perfectly cooked. A minute too long will mean overcooked meat. With sous vide cooking, on the other hand, that window of time is stretched into hours, which means your steak will be hot and ready to go whenever you're ready to sear and serve it. The one cooked to 160°F (well-done) lost more than 10 times as much juice as the 120°F rare steak. Additionally, with the well-done steak, you can see a distinct layer of rendered fat floating on top of the juices. I recommend cooking steak in the rare-to-medium range, so that you minimize juice loss while also keeping those fats inside the steak where they belong, adding flavor and juiciness to each bite. Here's a rough breakdown of how steaks feel at different degrees of doneness. Rare sous vide steak (120°F/49°C): Your meat is still nearly raw. Muscle proteins have not started to contract much and will have a slippery, wet texture. Chewier cuts, like hanger or flap meat, will be particularly tough at this stage. Fat has not yet started to render, so fattier cuts will have a waxy texture. I recommend cooking only very lean, tender cuts, like tenderloin, to rare. Medium-rare (129°F/54°C): Your steak is still nice and red, but muscle proteins have begun to tighten and firm up. You lose a bit of juice due to this tightening, but what you lose in juice, you gain in tenderness. Medium-rare steaks have a cleaner bite to them: Instead of muscle fibrils mushing and slipping past each other, as they do with very rare steaks, they cut more easily between your teeth. I recommend medium-rare for all types of steaks, though steaks particularly high in fat benefit from being taken closer to medium. Medium sous vide steak (135°F/57°C): Your steak is a rosy pink throughout and has lost about four times more juices than a rare steak. With a well-marbled piece of beef, however, the rendering, softened fat should more than make up for this extra juice loss. Coarsely textured cuts, like hanger, skirt, and flap meat, also become firm and juicy at this stage. I recommend cooking very fatty or coarse pieces of beef to the cooler side of medium. Medium-well sous vide steak (145°F/63°C): Your steak is well on its way to dryness. At this point, you've lost nearly six times as much juice as a rare steak, and the meat has a distinctly cottony, grainy texture that no amount of excess lubricating fat can disguise. If you must have your meat cooked medium-well, I suggest using very rich cuts, like short rib, skirt steak, or hanger, which suffer less than finely textured cuts, like ribeye, strip, or tenderloin. Well-done sous vide steak (156°F/69°C+): I get it. Some people like their meat well-done. However, there is no real reason to use a sous vide precision technique if you like your steak well-done. Just grill or pan-roast until it's as done as you like it. Does Timing Matter for Sous Vide Steak? I've seen some folks say that with sous vide cooking, once you set your temperature and add your meat, you can let it sit there indefinitely, with no change in quality. I even believed that myself a few years back. Since then, I've come to realize that's not quite the case. Even at low temperature, there are things going on. Enzymes are breaking down proteins. Chemical reactions are slowly taking place. To figure out exactly what happens when you cook steak sous vide for extended periods, I cooked identical steaks at 130°F (54°C) for periods ranging from one hour all the way up to 48 hours. I found that the most important differences typically occurred between the four- and 24-hour marks. As you can see, the steak cooked for just one hour stretches and pulls when you tear it. This gives the steak a pleasant amount of chew. It's still tender, but it tastes like a steak. By the time we hit four hours, that chew has been reduced a bit. Connective tissue has broken down, and individual muscle fibrils split apart easily instead of sticking together, though a four-hour steak is still pretty decent. Head all the way over to the 24-hour mark or beyond, and your steak ends up nearly shredding as you pull it apart. It's a strange mouthfeel: The steak is still plenty juicy (a steak cooked 24 hours loses barely any more moisture than a steak cooked for one hour), but the meat shreds instead of offering resistance or chew. For the best results, I strongly suggest following the temperature and timing charts below. I've included two separate charts to cover different categories of steak cuts. Highly marbled cuts, like a grain-finished, prime-grade ribeye or strip, should be cooked a few degrees Fahrenheit higher than leaner steaks like tenderloin, since their copious intramuscular fat helps keep them moist while delivering plenty of flavor. I prefer ribeyes and strip steaks cooked medium-rare to medium, around 129°F (54°C) to 135°F (57°C). Fattier steaks also have natural insulation, which means they'll take slightly longer to reach the correct internal temperature. Porterhouse and T-bone steaks contain a large section of strip and a smaller section of tenderloin. Since both sides must be cooked together, it's better to select a temperature and time based on the side you like to eat better. Personally, I like to optimize cooking time and temperature for the strip. It means my tenderloin comes out slightly more cooked than I generally prefer, but the insulating bone helps it stay plenty moist and juicy. Timings are all given for steaks one and a half to two inches thick. For steaks one inch thick or less, initial cooking time can be shortened to 40 minutes. Steaks cooked under 130°F should not be cooked longer than two and a half hours at a time, for food-safety reasons. Lean tenderloin is easily overcooked and, lacking intramuscular fat, will become dry. I cook my tenderloin steaks at several degrees Fahrenheit lower than fattier cuts, like ribeye or strip. I like my tenderloin in the very-rare-to-rare range, between 120°F (49°C) and 128°F (53°C), for optimal tenderness and moistness. The timings here are all given for steaks one and a half to two inches thick. For steaks one inch or less, initial cooking time can be shortened to 30 minutes. Steaks cooked under 130°F should not be cooked longer than two and a half hours at a time, for food-safety reasons. Preheat your sous vide precision cooker to the desired final temperature according to the chart above. Allow the water bath to come to temperature before adding your steak. Make sure to get the edges as well! If using aromatics, like thyme or rosemary sprigs, add a few to the bag now, distributing them evenly on both sides of the steak. Seal the bag, either by using a vacuum sealer or, if you're using a zipper-lock bag, with the displacement method. To do this, slowly lower your bagged steak into a pot of water, letting the pressure of the water press air out through the top of the bag. Once most of the air is out of the bag, carefully seal the bag just above the water line. Drop the bag into the water bath, making sure not to block the intake or output sections of your precision cooker. If properly sealed, the steak should sink. Cook according to the timing charts above. Remove the steak from the bag, and place it on a paper towel–lined plate. Pat it dry very carefully on both sides. Steak cooked completely sous vide will not have any browning on its surface, so this must be added afterward for improved flavor and texture. The stovetop is a great way to add a nice, well-browned crust to your meat. Skip this section if you prefer to finish your steak outdoors on the grill. Turn on your vents and open your windows. 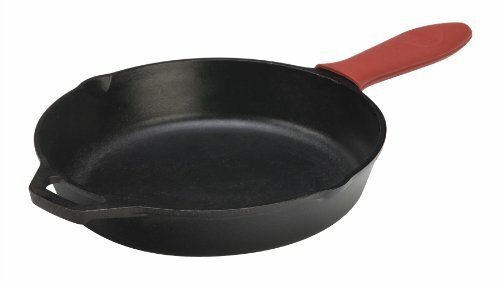 Add one tablespoon of vegetable, canola, or rice bran oil to a heavy cast iron or stainless steel skillet set over the hottest burner you have, and preheat the skillet until it starts to smoke. Gently lay the steak in the skillet, using your fingers or a set of tongs. If desired, add a tablespoon of butter. Butter contains milk solids that will blacken and char, helping your steak achieve a dark crust much faster and adding a characteristic slightly bitter, charred flavor. I happen to like this flavor (and it's typical of a steakhouse experience). For a cleaner-tasting sear, omit the butter at this stage. If desired, add aromatics, like whole thyme and rosemary sprigs with the leaves still attached, sliced shallots, or crushed whole garlic cloves. After 15 to 30 seconds, flip the steak so that the second side comes into contact with the pan. Repeat, flipping the steak every 15 to 30 seconds, until it has developed a nice brown sear, about a minute and a half total. If you did not add butter in step three, add butter to the skillet about 30 seconds before the steak is done for added richness. If you've got a high-output torch, now is the time to break it out to add some steakhouse-quality char. So long as you torch while simultaneously adding heat from the stovetop, you should not have any issues with un-combusted fuels giving the steak off aromas. Immediately after flipping the steak, start torching the first side, working in slow, even strokes back and forth across its entire surface, until it's pale brown with a few darker, singed spots. Repeat the torching process with each flip. I suggest using either an Iwatani trigger head on a butane canister (the inexpensive option) or a Searzall attachment rigged to a Bernzomatic trigger-start torch head on a propane cylinder. Using tongs, pick up the steak and rotate it so that the edge is in direct contact with the skillet. Continue to cook, rotating the steak along this edge, until all of the edges are browned, about another 45 seconds total. Transfer the steak to a wire rack set in a rimmed baking sheet. Though there's no real need to rest a sous vide steak, you may want some time to get your table set, your wine poured, and your sauces and guests ready. There's a trick to re-crisping the steak and making sure it's nice and hot when you serve it: When ready to serve, reheat any fat and juices left in the pan until they're sizzling, then pour them over the steak. Make sure to serve the steaks immediately after crisping, with coarse sea salt, such as Maldon, on the side. The grill can add a nice smoky char to the surface of a steak. For an easy cookout, cook your steaks sous vide, then transfer the water and the steaks to a beer cooler and seal it shut to take with you to the grill. When ready to cook, crack open the cooler, un-bag the steaks, and grill them to give them surface texture and flavor. Super-high heat is essential here. Your goal is to sear hard and fast, so that the exterior of the steak gets color, without overcooking that perfectly finished interior. To do this, light one chimney full of charcoal. When all the charcoal is lit and covered with gray ash, pour out and arrange the coals on one side of the charcoal grate. Set the cooking grate in place, cover the grill, and allow it to preheat for five minutes. Alternatively, set half the burners on a gas grill to the highest heat setting, cover, and preheat for 10 minutes. Scrape the grill grates clean with a grill scraper, then oil the grates by holding an oil-dipped kitchen towel or paper towels in a set of tongs and rubbing them over the grates five to six times. Place steak directly over the hot side of the grill and cook, turning every 15 to 30 seconds, until a deep, rich crust has formed, about one and a half minutes total. If the fire threatens to flare up as the steak drips fat into it, suffocate the fire by closing the grill lid until the flames die out. Alternatively, transfer the steak to the cooler side of the grill, using a set of long tongs, and let it cook there until the flames subside. Do not allow the steak to become engulfed in flames. Q: What are the downsides to cooking steak sous vide versus using a more traditional method? It takes longer. A traditionally cooked steak goes from fridge to plate in 15 to 20 minutes (a bit longer if you have to preheat your oven). A sous vide steak will take an hour or more, though, with sous vide cooking, this time is almost 100% hands-off. You will not achieve the exact same sear. Flag-waving sous vide zealots may claim otherwise, but the rapid sear you achieve after cooking sous vide will not be as thick or crusty as the sear you get from a traditional cooking method. Some folks prefer a thicker sear; others prefer the thin sear achieved after sous vide cooking. It requires more equipment. Cooking a steak sous vide requires a precision cooker and a plastic bag or vacuum sealer, in addition to all the tools required for more traditional methods. Chances are, if you're reading this article, you already have those extra tools. Remember this: Sous vide is not a silver bullet, or a panacea meant to solve all of your cooking problems or to replace more traditional methods. It's a tool meant to expand your options. Q: Can a sous vide steak get a good crust? That was cooked using a combination of a ripping-hot cast iron skillet and a propane torch. It's true that the crust will not be as thick as on a traditionally cooked steak. Whether or not this is a bug or a feature is up to you to decide. Q: When should I season my steak? Seasoning a steak prior to vacuum-sealing it, then letting it rest in the bag, can result in meat with a firm texture, similar to that of a mildly cured ham. Some folks find this texture off-putting, though I personally don't mind it. To avoid this texture, it's best to season and bag a steak immediately before cooking, or after cooking sous vide and before searing. In either case, only the exterior of the steak will be seasoned, so it's always a good idea to serve your steak with coarse sea salt, such as Maldon, for sprinkling at the table as your guests slice. Q: What happens if I leave a steak cooking sous vide for longer than the maximum time recommendations? Is it dangerous? So long as you're cooking at above 130°F, there are no real health risks associated with prolonged sous vide cooking. You will, however, eventually notice a difference in texture. For best results, I don't recommend cooking any longer than the maximum recommended time for each cut and temperature range. See the section on timing above for more details. Q: Should I put olive oil or butter in the bag? I've seen recipes that recommend adding fat to the bag, though none that offer plausible reasons for doing so. I decided to test whether or not it adds anything to the process by cooking three steaks side by side: one with nothing added to the bag, one with olive oil, and one with butter. I also repeated the test with some thyme sprigs and garlic added to each bag. Intuitively, you may think that adding a flavorful fat, like butter or olive oil, will in turn help create a more flavorful steak. In fact, it turns out that this achieves the opposite goal: It dilutes flavor. Fat-soluble flavor compounds dissolve in the melted butter or oil and end up going down the drain later. Similarly, flavors extracted from aromatics end up diluted. For best results, place your seasoned steak in a bag with no added fats. Q: Can I add aromatics, like herbs or alliums, to the sous vide bag? Yes, you can. I like to add thyme or rosemary sprigs, along with sliced shallots or garlic cloves, to the bags with my steaks during cooking. Adding the same aromatics to the pan as you sear the steaks will bolster that flavor. Q: Can I add a spice rub to my steak? Yes, you can, but spice rubs behave quite differently under sous vide conditions compared with standard cooking conditions. Normally, aromatic compounds will dissipate into the air in the kitchen or over your grill as a spice-rubbed steak cooks. At the same time, moisture dissipates, which means what's left of your spices sticks firmly to your meat. With sous vide cooking, there's no way for that flavor to escape the bag. Meanwhile, spices rubbed on the surface of the meat have a tendency to get rinsed off by any juices that are being expressed. The short answer is that it's very tough to predict exactly how spices are going to react in a sous vide bag. I've found that if I want spice flavor, it's better to rub the spices into the meat after the sous vide cooking phase and before the final searing phase. Q: Should I pre-sear my steak? After repeated testing and blind taste tests, I've found that pre-searing a steak—that is, browning the steak before it goes into the sous vide bag, then browning it a second time just before serving—serves at most a very minimal role in improving flavor or texture. In most cases, the difference is imperceptible. There's no harm in pre-searing a steak, but I prefer the ease and convenience of simply placing the steak in the bag raw before cooking, leaving the searing for a single step at the end. Q. What about deep-frying the steak instead of searing after cooking sous vide? Deep-frying a steak cooked sous vide can be a lot of fun, and it's true that you'll get a very quick, evenly browned crust on your meat, but there are a few downsides. First, the obvious: It requires you to have a large vessel filled with hot oil for the frying. If you're anything like me, you like to keep deep-frying to a minimum at home for that reason. Perhaps more importantly, deep-frying has a relatively low maximum temperature that is defined by the oil's smoke point—generally around 450°F (232°C) or so. Oil in a skillet or a steak on a grill, on the other hand, can achieve temperatures a couple hundred degrees higher than this, allowing your steak to char rather than simply brown. For me, this charring and the intense flavor it brings are among the hallmarks of a great steak experience. Q: Can I use a torch alone to finish a steak? I would strongly recommend against it. Torches are extremely intense heat sources that basically follow the inverse square law: Their intensity dissipates with the square of the distance from the torch head. What this means is that any unevenness in the surface of your steak gets amplified; areas that are slightly elevated will singe before areas that are lower will even begin to brown properly. While it's possible to get reasonable browning with a torch by holding it at a distance great enough to minimize this effect, and by making multiple slow passes across the surface of a steak, I find the hassle and time it takes so much more of a headache than simply cooking a steak in a hot skillet, with the torch as an added heat source. Besides, a steak cooked with a skillet-and-torch combo comes out with a better crust in the end. Q: What's the best torch for searing steak? Standard propane torches with trigger-start ignition heads have trouble staying lit when inverted. This can be a problem when you're frantically trying to relight a torch as your steak sears in a hot skillet. Adding a Searzall unit will not only ensure that the flame stays lit, but will also diffuse the flame, allowing you to get a more even sear. Want to keep things on the cheap? I find that a standard butane gas canister with a high-intensity torch head, like the Iwatani Torch, does a more than adequate job. It's what I pack in my travel cooking kit. Q: Does steak finished with a torch acquire any off aromas? Finishing a steak with nothing but the naked flame of a propane or butane torch can indeed leave an off, gasoline-like aroma on the surface of the meat due to imperfect combustion. However, if you're using the skillet/torch combination method, the added heat from the skillet will help the fuel combust more completely, while the dilution of any un-combusted fuel by the fat and juices in the pan will render them completely imperceptible. If, for some reason, you do choose to sear with a torch alone, a Searzall unit will improve combustion efficiency and completely eliminate those odors. Q: Can I chill and reheat my steak after cooking it sous vide if I haven't opened the bag? It's true that given a high enough temperature (130°F or higher) and a long enough time period (several hours), the contents of a sealed sous vide bag should be close to sterile, which means that rapid chilling via an ice bath followed by rapid reheating should pose no health risks, though I still strongly recommend against it whenever avoidable. It's not doing any favors for the quality of your steak. Q: Can I cook a steak straight from the freezer? Yes! I often seal seasoned, ready-to-cook steaks in sous vide bags and stack them in the freezer. For steaks an inch to two inches thick, when you're ready to cook, allow an extra hour for the steak to fully thaw in the hot-water bath before you begin timing it for doneness. Q: Does sous vide steak need to rest? Traditionally cooked steaks need to rest; that is, they need to be placed aside for five to 10 minutes before they're cut and served. This resting period is to allow time for the temperature gradient within the steak to even out. The cooler center is gently heated by the hotter outer edges, while the edges in turn lose some of their heat to the outside world. Even temperature is important: It's what prevents a steak from leaking its juices everywhere the moment it's been sliced open. Because a sous vide steak cooks from edge to edge with more or less perfect evenness, there is no temperature gradient inside. A medium-rare steak should be 130°F from the very center to the outer edge, with only the outer surfaces hotter after searing. Sous vide steaks can be served immediately after searing. The very minimal resting they need will happen on the way from the kitchen to the table. This guide produced in partnership with Anova Culinary, makers of the Anova Precision Cooker. Download the Anova app for built-in temperature and timing guides along with full bluetooth control over the Anova Precision Cooker.